This Clothespin Ghost is easy to make from things you have around the house, and he stand up all by him self! A great Halloween decoration! 1. Cut out an oval or circle from your cardboard and insert it into your clothespin. 2. 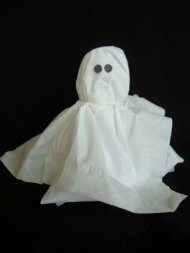 Place a couple of facial tissues over top and tie a piece of string or rubber band around the neck of the ghost. 3. Make your ghosts face with a black marker or glue on tiny black circles found in your hole punch!